Tom Gleghorn first came to public attention as an abstract artist of note during the late 1950s, through a succession of art prizes. He maintained a successful career as an artist, whilst lecturing and holding teaching positions at a number of art institutions including the National Art School in Sydney (1964-68), Canberra Art School and in Adelaide. Like a number of his contemporaries in Sydney, Gleghorn drew his primary inspiration from the landscape, stating in 1969 that his paintings 'are about events and remembered experiences, related to things seen, felt, or heard, with a high value placed on the expressive qualities of gesture and mark'. 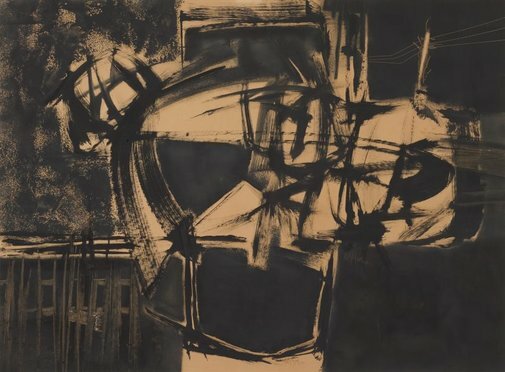 It was for the latter that he was particularly admired; a reviewer of his 1960 solo exhibition at Macquarie Galleries praised his 'sweeping, rich, black brush work combined with dense, yet fresh washes of tone', stating that Gleghorn 'now possesses more verve of expression through his formidable technique than most Sydney artists'. Signed and dated, l.r., pencil "Thos Gleghorn v.60". Signed and dated bot.c., black ink "Thos Gleghorn v.60".